Reese and Finch crashing weddings like they’re Owen Wilson and Vince Vaughn? OK, so their nuptial adventure had more fighting off hitmen than avoiding stage five clingers, but there were still some humorous moments on Person of Interest Season 5 Episode 6. But can you imagine if it was Reese who had to be the singing uncle from Dublin and Finch had to be the stripper (or stripper security) at the bachelorette party? Either way, it was fun seeing the two of them have to really get into their new identities for the wedding. I did expect someone like Zoe Morgan to have appeared at such a high-class event, and the banter between her and Reese would have been entertaining. But alas, she just wasn’t on this episode’s guest list. It was certainly good to see the team working together, including Root getting out of the subway hideaway. I like the classic Finch and Reese pairing, but Root does add a fun unpredictability. Stabbing that guy in the hand during the fight? Swooping in to save the day on horseback? Yeah, those are definitely things Root would do. But even with some of the fun moments, the main story was pretty standard case of the week fare. 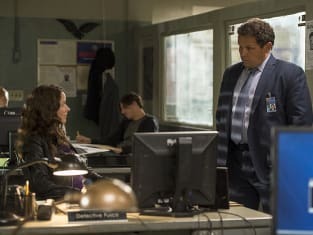 I found myself far more eager to get back to Fusco’s investigation or even Shaw hanging out with Greer. 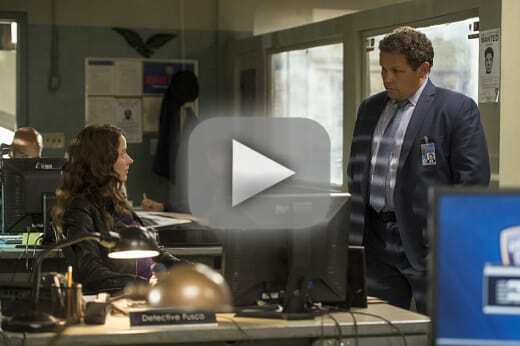 I am worried about Fusco the more Person of Interest Season 5 episodes we get into. Will he survive by the time the season is over? Not only has he continued to nose his way around the missing persons, he discovered a bunch of them… and they’re dead. I was surprised that Bruce Moran, who only just reappeared on Person of Interest Season 5 Episode 5, was dead. I know there are a less amount of episodes this season so things are moving a bit quicker than usual, but that felt so sudden. Though, it illustrated the dangerous waters that Fusco has dived into. That demolition explosion at the end further emphasized that. He’s definitely in over his head now, I just hope it’s not to late for the POI team to get to him. Then there was Shaw getting another fake reality from Samaritan. I don’t know how her brain can take all these simulations and fake outs, but I liked seeing Samaritan try and spin the story that it isn’t the bad guy. Samaritan just wants to protect the people from themselves, and it wants Shaw to help it out. I find it hard to believe that Shaw could be swayed, even if Samaritan and Greer did provide some interesting arguments. What’s more, the battle with Samaritan does make me wonder if Root’s advice about unleashing the Machine completely, allowing it to fight alongside them, would be a good thing. It seems like it would be, especially because of who created it, but Finch also should have that right to be concerned. We’ve seen the power of Samaritan. What if the Machine turned against the POI team and teamed up with Samaritan? The possibilities for how this series could end are still wide open, and that’s exciting. Did you enjoy the wedding? Will Shaw join Samaritan's team? Sound off below! Plus, make sure to watch Person of Interest online. It is the final season after all. NOTE: Person of Interest Season 5 Episode 7, "QSO," airs May 24 at 9 p.m. If this is what you've been warning me about, you need to tell me what we're dealing with now! Permalink: If this is what you've been warning me about, you need to tell me what we're dealing with now! Imagine what she could do if we allow her to fight with us. Permalink: Imagine what she could do if we allow her to fight with us.